Most motorcycle suspension is set up for a rider weighing 170lbs with a helmet and riding gear and carrying a maximum of 15lbs of luggage. If you exceed those numbers or are installing a new aftermarket shock, it’s a good idea to check the sag on your suspension. 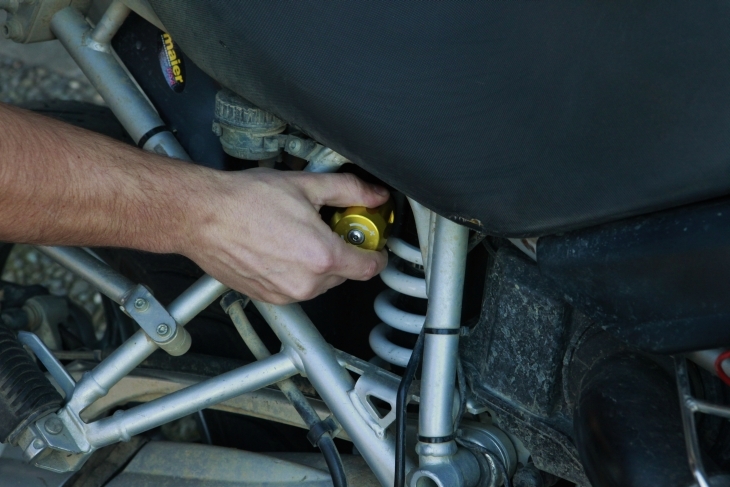 Suspension sag can be adjusted by adding or removing spring preload on your shock. Motorcycle suspension is designed to be ridden with about 30% of the overall travel used when the rider and luggage are added to the bike. 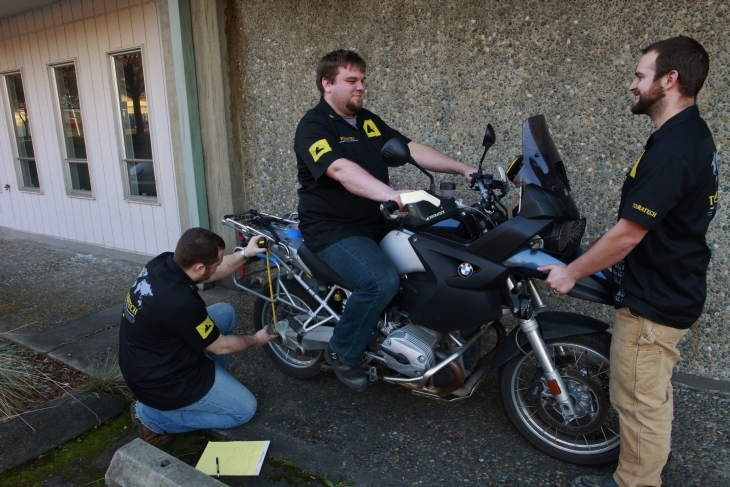 An appropriate sag setting will allow your motorcycle to have 70% of its suspension travel available to absorb upward movement of the wheel and 30% available to let the wheel drop down into dips in the road or uneven terrain to keep your tire in contact with the ground. Most adventure bikes are equipped with remote hydraulic preload adjusters that make it convenient to adjust the rear suspension sag. 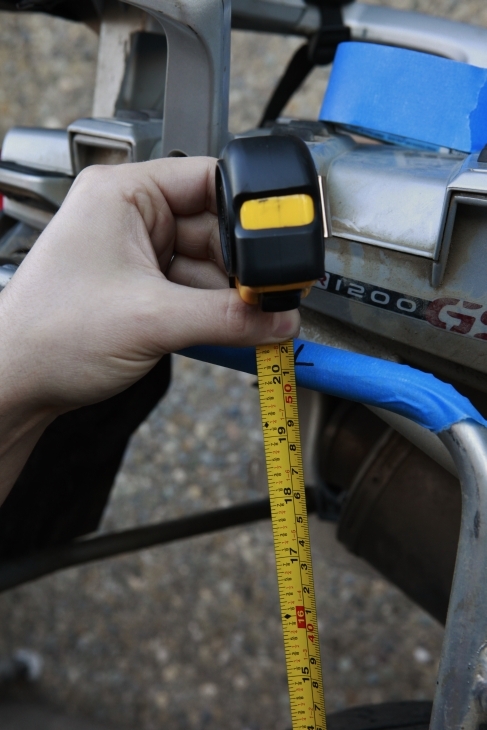 Remember, any time you add or remove weight from the bike you should measure and adjust your suspension sag to keep your bike handling properly. For adventure motorcycles we are primarily interested in the ‘race sag’ which simply means the sag from the weight of the bike and rider. When the ‘race sag’ is set correctly the bike will ride down the road level with the suspension positioned with the correct ratio of up and down travel available to keep the ride smooth and the tires on the ground. It also ensures that the correct geometry is achieved allowing proper steering and handling. Note: A bike that is sagging too far will have slower turning and a diminished feeling of control by the rider. Most manufactures provide a sag specification for the rear suspension. This number can be presented as a measurement (ex. 60mm), as a percentage (ex. 30%), or as a ratio (ex. 135:65). If this specification is not available, you can simply take the total rear suspension travel of your motorcycle and use 30% of that number as your “race sag specification.” If your motorcycle has 10 inches of suspension travel at the rear wheel, and the manufacturer has not provided a sag specification, then it is safe use 3 inches (30% of 10 inches) as your race sag. Example: BMW provides the ratio of 135:65 for the rear suspension of the BMW R1200GS. This means that the rear suspension has 200mm total travel and 65mm of that should be used as race sag. In this case the sag specification equals 32.5% of the total suspension travel. It’s best to ask a friend or two to help you with this process. 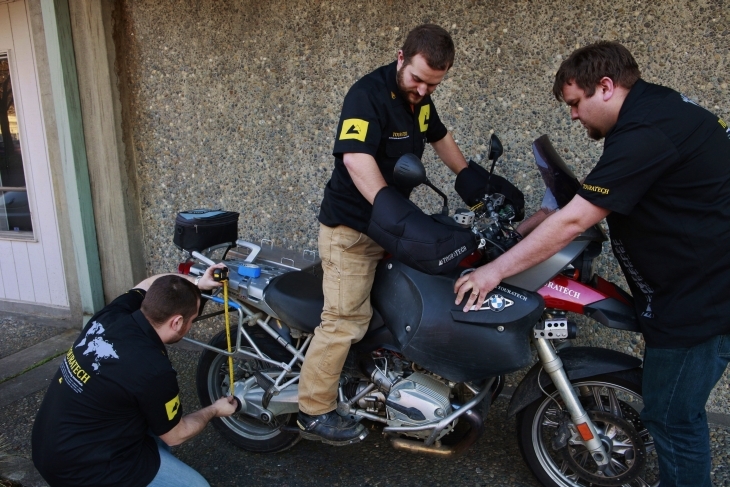 Having an extra set of hands will make it much easier to take measurements while the rider is on the bike. 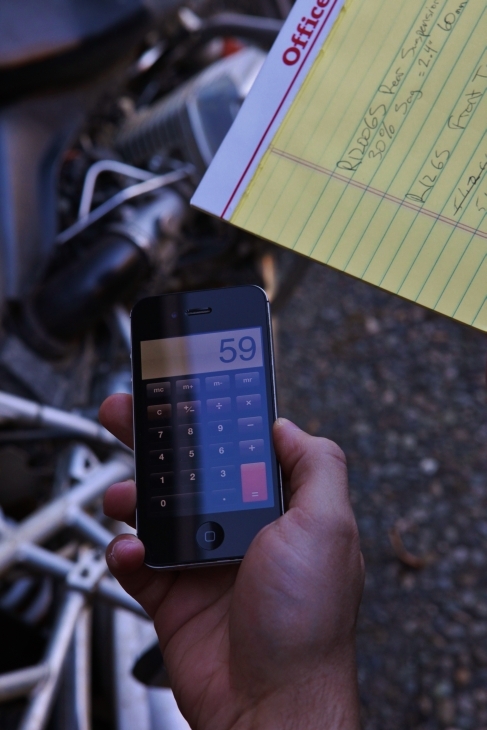 1) Your motorcycle loaded with all the gear you are trying to set the suspension up for. 2) Rider fully dressed in riding gear. 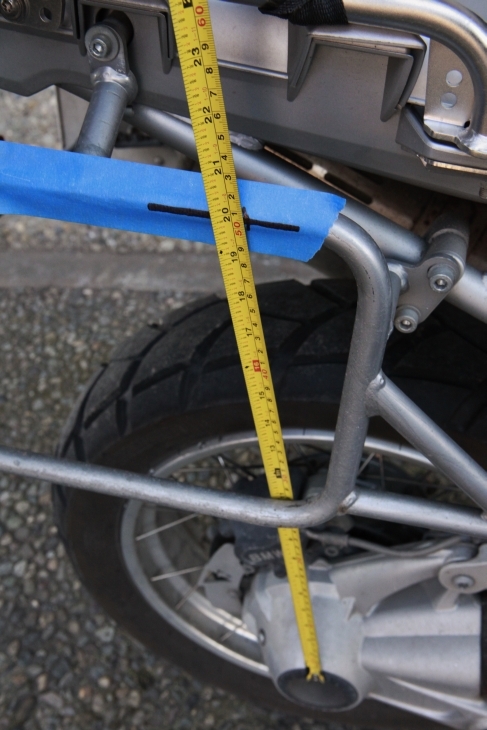 Using the BMW R1200GS as an example, if the race sag number your measurements generated is more than 65mm you will need to ADD more spring preload to the suspension. If the number generated is less than 65mm you will need to REMOVE some spring preload from the suspension. After you have made a small adjustment to your spring preload, repeat step 2 to see how your adjustments changed the race sag. Continue to adjust the spring preload and repeat step 2 until your race sag meets the specification that is correct for your bike. If your motorcycle is equipped with a remote hydraulic preload adjuster it will be mounted near the rear shock and marked with the symbols +/-. These knobs will ADD spring preload when turned clockwise and REMOVE spring preload when turned counter-clockwise. These adjusters make it easy to change the spring preload for different weights (rider and gear) on the bike. If your motorcycle does not have a remote hydraulic preload adjuster, the body of the shock will likely be threaded and the shock spring will be supported by a large nut or threaded collar. You can ADD spring preload by tightening this nut and REMOVE spring preload by loosening the nut. Be careful when adjusting this nut because you can tighten it too far and create a condition called “coil bind” where the spring compresses against itself before the suspension bottoms out or you can loosen it too far and when the rear wheel is off the ground the shock spring can become loose on the shock. Both of these extremes may cause improper performance or dangerous conditions. If you find that you are not able to adjust the spring preload enough to make the correct race sag you will need a shock spring with a different rate and/or a different shock for your motorcycle. Click HERE to see the comple selection of Touratech Suspension.